Kelowna was incorporated in May 1905 with a population of 600, when farming as the economic mainstay of the region. The municipal organization that works to enhance the experience of living in Kelowna is comprised of nearly 900 passionate staff, including a strong Leadership Team, and led by a City Manager and Council committed to making Kelowna the best mid-sized city in North America. Through strong financial management, we are able to provide core services, build new amenities and maintain existing infrastructure. The Citizen Survey results showed that 79 per cent of residents believe they receive good value for their tax dollars. Check out the City Views publication for a look into our services and projects. Many services provided by us can also be found in a self-serve format online. Available 24/7, residents can submit a request, stay informed on City news, e-Subscribe for updates and chat with us on social media. Take a look at our most recent Annual Report to discover more. Our Armorial Bearings were officially accepted by City Council on Jan. 3, 1955 as granted in a Letter Patent by the College of Heralds in England. The shield, with wavy blue lines on white at the base, depicts Okanagan Lake from which rise three white piles, representing mountains; above these are two apples of gold. Astride the shield, knightly armour, surrounded by a wreath, supports an apple tree bearing apples. At the base of the tree, the crosscut saw is emblematic of the lumber industry and early pioneers. The supporters are, on the dexter side, a grizzly bear, indicating the derivation of the city’s name, and, on the sinister side, a seahorse, which in heraldry is the closest approximation of our Ogopogo. 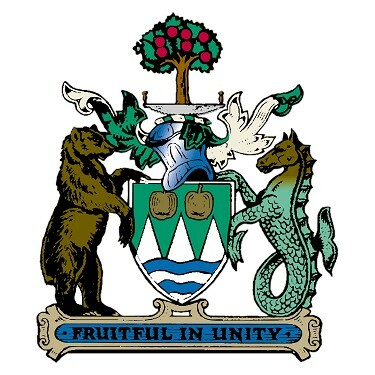 The Motto, “Fruitful in Unity” alludes to Kelowna’s steady progress, largely attributable to its fruit industry and the community mindedness and cooperation of its citizens. To be the best mid-sized city in North America. Leading the development of a safe, vibrant and sustainable city.